Haru has an excellent sense of taste and great talent as a chef, but her “spirited character” was too much for her first husband, who divorced her after only one year of marriage. When a famous samurai chef from Kaga observes Haru’s culinary abilities, he has a brilliant idea. The Funaki family, who have served the Lord of Kaga for generations, are known as “kitchen samurai” for their innovative dishes. However, the heir to the family business, Yasunobu, shows little aptitude for or interest in cuisine. 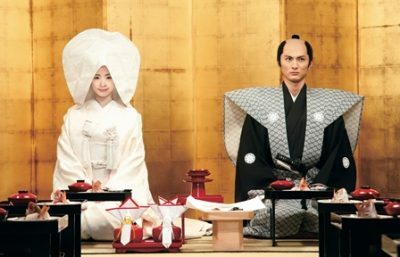 In order to save the Funaki family name and their reputation as kitchen samurai, Haru agrees to marry Yasunobu and teach him the art of cooking. But will he be a willing student of this independent and opinionated new sensei? This story was inspired by a real-life family in Kaga that survived countless historical upheavals with its cuisine. Kaga Cuisine is famous for wide variety of luxurious dishes served on colorful lacquer ware and Kutani porcelain, ranging from ordinary home cooking to Chinese-influenced haute cuisine rivalling even that of Kyoto.